The hive I split six weeks ago swarmed today. The split itself was successful. 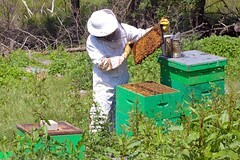 Lisa looked into the hive Monday and found multiple frames of capped brood, and honey being laid down. She gave them a honey super with a couple of frames of old (to thick to extract) honey. When I looked today the honey was gone and there were bees all over the new super. This usually means that the hive is about to start putting honey there. I put in three more frames of old honey, hoping they’ll refurbish them as well. Lisa also took a quick look at the old hive and found it crammed with bees. It already had a super and honey had started going in. She also mentioned to me today that she saw pollen coming in on every forager, a sure sign of heavy brood rearing. I should have had her look into the brood nest for swarm cells, but hindsight is always 20-20. Lisa saw the swarm tornado about ten this morning, and by the time I got suited up, the swarm was in the pine tree. It was a big one, easily twice the size of the ones I remember from 2004-05. 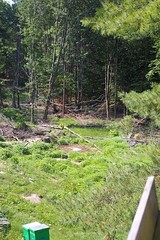 The old hive was still covered with bees, and I went in anyway. The hive body was also still full of bees although the super had neither honey nor bees, and there were frames and frames of capped brood including several swarm cells and row after row of drone cells. A virgin queen needs mates after all. I didn’t see any young brood though. It makes sense that the queen’s slimming down to flying weight stops her laying temporarily. Anyway, a couple of weeks without new bees won’t be an issue for this hive, it still has plenty. Unfortunately the swarm had taken all the honey with it. I found a couple frames with uncapped nectar, but there was no honey or pollen anywhere. They’re fine with all those foragers in the middle of June, but the swarm took probably 70 pounds of honey that will have to be replaced before any gets laid down for us. Looking at the situation, I decided to try another split, since there seemed little to lose. I still had three deep supers, all with partially drawn black plastic frames. (I’d used the good stuff in May.) I pulled two frames of brood, including three unopened swarm cells, and two additional frames of bees and put them in a deep super on an adjacent pallet. Since they’ll have few foragers for several days, I gave them half a super of 2008 honey to tide them over. I made sure that the brood frames left behind included at least one swarm cell. I’m now remembering that there was at least one empty swarm cell as well. I’m hoping that if there is a virgin queen out and about she had not had time (only minutes after all) to kill her sisters before I whisked them away. There is no brood in either hive young enough to raise a queen from. By the time I was done, the swarm had moved on. I’ll keep an eye out for it, but I’m not optimistic. 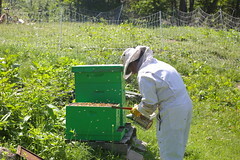 There’s still plenty of time for us to get honey from the two older hives. I’m less optimistic about today’s split, given all the comb it has to draw, but global warming and invasive plants might give us a super of Japanese knotweed honey in the fall. Two hours later and the old hive looks like it never swarmed. The bees in the new split are throwing out trash, including a surprising amount of wax I’d have thought they could re-use. I have a few pounds that I’d be happy to sell. Cappings and burr comb from 1-4 hives don’t add up that quickly. I melted it in a crockpot and filtered it through butter muslin. Drop me an email with the price – if I can swing it and it worked for you, we could do the hand off at the Iceland event.